At the Blockupy Festival in Nov 2014 Blockupy International, a network of many different movements, organizations, networks from various European regions decided to mobilize European wide and organize transnational actions against the European Central Bank’s opening gala in Frankfurt on March 18th. “Let’s take over the party”! 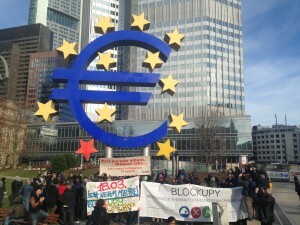 (http://blockupy.org/en/4344/call-march-18th-2015-transnational-actions-against-the- european-central-banks-opening-gala-lets-take-over-the-party/). The call has been translated in the meantime into 17 languages, networks in different regions as well as transnational networks have put March 18th (#18M) on their agenda and started mobilizing. On January 17th we came together for a productive European wide, transnational coordinating meeting. Networks, organizations, groups, parties from many different countries as well as transnational networks attended and started the common planning, coordination, mobilization process. We established links and contacts to the working groups of the Blockupy alliance in Germany (the action planning group, the webteam, the mobilization group). And even now it is clear: buses, contingents, delegations from all over Europe will be in Frankfurt on March 18th – from Italy, Greece, Sweden, the Netherlands, Denmark, France, Belgium, Portugal, Slovenia, Spain and more to come. They come together as a European space opened up in the last years – here now for activities and blockades of the ECB opening gala in the morning. We will come together for a central, broad rally and raise our voice and we will march together in and through the inner city of Frankfurt in the afternoon. This report of the meeting will give an update on the activities planned so far. It summarizes the results, political discussions, agreements we made in order to arrive at a good point on March 18th and beyond. It also indicates what to expect from Blockupy International and how to get involved in the mobilization and planning yourself. 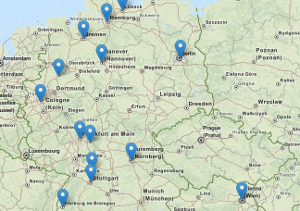 Of course, this is only the beginning, there is a lot of coordination and planning still to be done – get involved, get in contact with us (international@blockupy-frankfurt.org) or the regional networks (see the networks involved below), stay tuned! Precarious Disconnections (It), DinamoPress (It), coalition of social centers / globalproject (It), Precarias Inflexiveis (Pt), All at Alla (Sn), interventionist Left (D), Attac France, NoTroika Frankfurt (D), DIE LINKE (D), Attac (D), D19/20/Altersummit (Belgium),Thomas Occupy (D), Blockupy Plattform Berlin (D), Euronomade (It), Rosa-Luxemburg-Foundation (D), Syndicat Solidaire (Fr), Socialist Youth (Dk), Syriza/EL (Gr), Solidarity 4 All (Gr), globalinfo.nl (NL), no one is illegal (D), Izquierda Unida/PCE/EL (Es), feminist intervention Blockupy (D), SEL (It), umsGanze/Beyond Europe (D/Europe). With greetings alos from Slovenia (Democratic Socialists) and the GUE/NGL, who couldn’t attend but will be in Frankfurt. All those networks who attended plan to mobilize in their networks and regions. Of course it is not clear now how many people /delegations/ buses will come. But the first overview was really exciting and it seems safe to say that hundreds or even some thousands of activists will come to Frankfurt from outside of Germany. Of course our mobilization efforts have to be strengthened to reach deep into our networks (regionally and thematically) and to reach far beyond the networks already involved. We will have to use all opportunities for trans-/national meetings to intensify the mobilization and establish new contacts! Furthermore, the Greek elections could “help” to mobilize even further networks – it is not only a Greek election but the dynamics will be of European significance.There is the concrete opportunity to challenge the European austerity regime as it is right now. This means a radical renegotiation of austerity measures + Troika politics, it will also mean a harsh response from the European elites – especially the German government we need to respond to. Our task as Blockupy International is to make this connection to #18M and to relate the events happening in the next 3 months (Greece, Blockupy, etc.) – plus thinking about what that means after March 18th. For those not able to come to Frankfurt, there are also ideas of organizing protests “at home” – at Central banks, at places symbolizing the Troika or other meaningful sites. In November we decided against a call for decentral action, however, if there are activities planed, they should be included in our efforts of coordination and been known about. Starting early the morning will be dedicated to blocking the “ECB opening gala” (which will take place as announced by the ECB at 10.30 am). We are expecting that there will be a wider red zone around the ECB. We are working on different tactics to have an efficient protest on the day. In order to be successful that means to get going really early in the morning. The Blockupy alliance will “register” several rallies and assembly points as “safe spaces” for the morning – to assemble, to get back to etc.. Furthermore, to make it possible for many and diverse people to join this part of the protest an “action consensus” will be agreed upon (similar to the ones from 2012 and 2013). At 5 p.m. we will have a common manifestation/march to end the day together and to invite those from Frankfurt who won’t participate in the morning events. There might be – but not decided yet – a second “wave of protest” between the morning blockade and the central rally for thematic, decentral activities. Since we will have an early start on March 18th everybody who manages to travel on the 17th already is asked to arrive until March 17th at 8 p.m.. There will be a central alliance assembly for an update on the information, last planning, contact etc. However, those who travel at night and come early in the morning will get all relevant information of course too. There will be a bus coordination (arrival coordination) set up before hand. Networks should be prepared for deciding on (English speaking would be best) reliable contacts.There might be a chance to organize MPs for the buses after crossing the border so that stopping the bus by the police is made more difficult. Of course there will be also a info/hotline set up in German and English, it will start on March 17th. It would be good for all the buses and arrival networks to think through strategies how to turn the trip as well as possible encounters of difficulty on the trip into “action” itself. 18M will start not only in the morning but with the trip itself. Accommodation, infopoints when arriving in Frankfurt as well as the hotline is taken care of by the Blockupy alliance in Germany. The basic information on the day and the “action consensus” will be compiled to be distributed to and discussed within all networks and groups as soon as possible. 3. Mobilizing for March 18th as a common and political task – results, agreements etc. There is a need for a common communication campaign and political mobilization strategy, which could concentrate on 1-3 central messages of “Why one should come to Frankfurt” right now, plus a regular update on planning and organizational matters should be available continuously from now on in English. We agreed to update the call from November until early February to stress the current situation and options (e.g. Greece) as well as the consequent reasons (and obligation) to come to Frankfurt now. It is a European question, not a Greek or German one. It will also include news about #18M and the activities planned (including the action consensus, and the agenda for the day). much of the mobilizations efforts have to be done regionally and/or thematically – but we need to coordinate, enlarge, update us on these efforts – and define when we need to do something together. There is no “headquarter” or overall European coordination structure so to say to delegate the work to, but of course we should gather all information and find solutions to questions/problems together. Plus, we might need to establish a mobilization calendar once again, with regional events but more importantly with events of far reaching/European wide character so that one of us can attend these. (Printed) Mobilization material will be available soon for download (basic flyers, posters) or rather logos, content frames, layouts will be available (raw material) so that one has the chance to produce one’s own material. the Press group will be also “internationalized”. The Blockupy alliance in Germany and Blockupy International has a basic work structure already in place. Rather than building a new and parallel structure, a connection to those structures was made and should be stabilized. There is of course an overall need for people to join this process! the Blockupy International working group will be the central place for the working, coordinating and common planning process. This working group works through a mailing list as well as through bi-weekly conference calls every other Tuesday at 6 pm for sharing news, doing the planning, deciding on issues. People who want to join the coordinating and work process should get in touch (international@blockupy-frankfurt.org). For those organizing delegations and contingents this could be a good idea, but all the information/results will be distributed also to the main Blockupy International mailing list. Since many of the things for #18M remain unclear yet – given that many things/activities will get decided/developed only in the weeks to come and in an ongoing process – an effective coordination structure needs to be build in the weeks to come. This concerns especially the coordination and good clear information structure we need for the days around the 18th of March – the day itself, the arrival/trip etc. For that reason it might be important to have another European wide coordination meeting in Frankfurt (Feb. 21st.). That will be decided early in February and announced. The meeting would be set up to talk much more in detail about the activities on March 18th in the morning, how to make stable links between the structures, how to find safe ways for communication etc. and how to organize the trip/arrival in a safe and good way. No decision has been made so far of course, but given the work of the last years and the need for a “European transnational space” – against the anti-Troika/austerity/crisis politics and for a “Europe from below” it seems clear that we won’t stop on March 18th with building out European/transnational structures, practices, working out common projects of course. Therefore before March 18th there should be a transnational meeting to be scheduled for the spring/early summer meet in April /May (and maybe not in Germany (Frankfurt); networks from Greece and Italy will take that question with them (depending on options, other larger meetings already planned, capacities and political significance). No decision was made on the question of project/topic yet.